Whoa, things are INSANE here. Hot on the heels of the FLOOR - Below & Beyond box set completion + shipment madness and KILLER reunion shows, we've got another round of new releases and general chaos over here. We nabbed 25 more copies of the Below & Beyond 8xCD set from our distributor, but they've already flown outta here. We're getting the remaining unsold band copies in a week or so, and that's probably it. 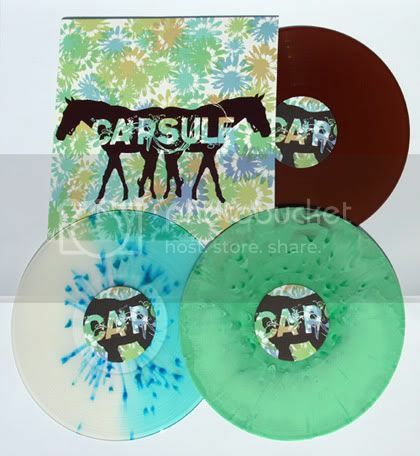 The deluxe vinyl version is still available, and we're also scoring the band's unsold t-shirts in roughly a week too. Beyond Below & Beyond (oof, sorry), we are psyched to announce yet another Robotic Empire label release from a sick South Florida band. CAPSULE's collections LP, Tape + Demo + Tour + More, is now available after being several years in the making. 15 tracks of totally berzerker complicatedcore, or, everything these ADD maniacs recorded prior to the Blue album we released a couple years ago. The release turned out rad with super bright artwork and a high-gloss finish (ala Blue) too, with some pretty outrageous colored vinyl to top it all off. Pretty sure we ordered 200 of the "snow drift" and "slime mold" colors, and 800 of the "cola" which turned out a rad translucent brown. Actually, they all turned out pretty sweet! This is technically a pre-order since it drops in stores/etc on April 13th (so expect them to arrive around that date), but we've got them in house now and they're good to go! Some tracks from that can be heard here (last 2 tracks) and/or ordered now in our Online Store. In the meantime, we decided to drop a cassette version of the phenomenal THOU - Baton Rouge, You Have Much To Answer For EP since the gatefold jackets for the vinyl version have to be completely reprinted. UGH. The tape turned out cool though with black/white/red covers, a black & white cassette, plus a two-color patch for good measure. Limited to 200, this should hopefully tide you over until the vinyl edition is finally ready for real, hopefully in just a few weeks. Listen to this in its entirety on our myspace and/or the band's website (along with everything they have released). This tape is available now in our Online Store. Phew! Wow that's a solid round of stuff. Please check out all this (and more) in the Robotic Empire - Online Store. Thank you!